I like reading historical fiction novels, but rarely do I read one set almost 2500 years ago. 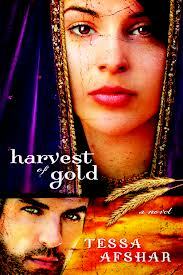 Harvest of Gold takes place in Persia and in Jerusalem during the rebuilding of its walls in 445 BC. Having studied Bible history, I am familiar with Nehemiah's story and was intrigued as to how the author would involve this Biblical character. Clearly, this is a well-researched story and pretty accurate regarding this time in history. The story is essentially about Sarah, an intelligent Jewish scribe, recently married to Darius, a Persian aristocrat, and their journey as their marriage unravels. Set during the restoration of Jerusalem during Nehemiah's time, the author uses the timeless principles in the book of Nehemiah as both Sarah and Darius struggle with issues of duty and faith. I was unaware that this book is the sequel to Harvest of Rubies, and only realized this as references were made to events from the first book that I was clueless about. I wished the author would have summarized some things that had taken place in the first book. Notwithstanding this, I still enjoyed this novel. It was refreshing because of the setting. The plot also included an attempt to murder King Artaxerxes. I liked the author's notes at the end of the novel that further explained historical details. Sarah is a strong female character and Darius is handsome and physically strong. There is passion between the two of them, although sometimes their behaviour confused me. One minute they are in each other's arms and the next they are pulling away and there is distance. They end up being apart for most of the novel. Sometimes it felt like I was reading a contemporary romance. Also, their dialogue often used expressions that were definitely not used in the middle east before the common era, such as the word “sweetheart” which originated in the 13th century and is an English expression. Because of this, there were times when I wasn't totally immersed or transported to the time and place of the story. Overall, this was a good story. I have the first book Harvest of Rubies on my Kindle, and will probably read it in the future when I'm in the mood for another different historical setting. It had so many rave reviews on Amazon. If you like Biblical historical fiction and romance, I suggest giving this one a try, but perhaps after reading the first book. It's clean with plenty of action.